As described in above, our environmental scan is based on two major information gathering activities: (1) review of published and unpublished documentation and (2) discussions with a small group of thought leaders and key informants knowledgeable about health information systems (HIS) and CHCs. We note that these discussions (which expanded on the initial activities originally planned at the start of the study) are not intended as substitutes for the series of 25 telephone discussions and seven in-depth site visits that will be undertaken once the environmental scan is complete. Rather, the discussions with key informants were conducted to supplement what was a relatively thin literature (both published and unpublished) on HIS issues confronting CHCs, and to identify relevant information that conventional literature search strategies might miss. Although ASPE, HRSA and NORC anticipated this dearth of relevant literature at the outset, we later determined that it would be important to conduct these initial supplementary discussions in order to ensure that the discussion guides and site selection for the later stages of the project were on target. Accordingly, we note that — as indicated in our original proposal — this environmental scan is more important as a vehicle to set up the subsequent project activities than it is as a mechanism for identifying conclusive results. In conducting both activities, NORC worked closely with ASPE and representatives from HRSA in order to relate environmental scan process and findings as closely as possible to the goals of the main project sponsors and CHCs themselves. In particular, we were asked to assure complete coverage of the range of current programs related to improving health center information systems, including use of grants sponsored by HRSA and private foundations, the potential use of existing government systems, such as the VA Vista system in community health settings, an overview of private sector advances in health center information systems and promising models for advancement of information systems goals at CHCs. Preliminary activities and coordination with ASPE. In the weeks following the project kickoff, NORC met with HRSA and ASPE to discuss key study questions and scope out environmental scan activities. At these meetings, ASPE and HRSA underscored the need to think broadly about the systems infrastructure, efficiency and regulatory compliance issues as they related to the mission of CHCs and the environment under which they operate. Furthermore, we were encouraged to look at CHC experiences working on systems projects funding through existing HHS or privately funded programs such as Shared Integrated Management Information Systems (SIMIS) and Community Access Program (CAP). We were also directed to a series of initial thought leader discussants including consultants who regularly work with CHCs on information systems issues. Following this initial meeting and initiation of environmental scan activities, NORC has produced two interim memos outlining progress on key tasks and next steps for completion of the environmental scan and subsequent project phases. Following delivery of each of these memos, NORC met with ASPE and HRSA in order to discuss findings and identify additional avenues for inquiry. Review of existing documentation. The environmental scan includes review and synthesis of information from existing published and unpublished documents. We used two major approaches in identifying materials for review. First, we conducted a formal search of major social science and health services research databases such as PubMed, HSRProj and PsychInfo, as well as databases such as Lexis-Nexis that may include popular, non-peer reviewed publications. Finally, in order to assure comprehensive coverage of publicly available information, we conducted targeted searches of content available on the Internet using Google.com and other powerful search engines. Searches were conducted using a range of subject-level key words crossing “community health centers” or “FQHC” and “information technology”; “HIPPA”; “practice management”; “electronic medical records”; etc. In addition, we conducted a general literature search on HIS related topics alone to uncover review articles or other publications that characterize the current state of health information management systems as they relate to both public policy and the goals of CHCs. The second and more fruitful approach, to identifying appropriate information for review included directly contacting individuals at relevant organizations in order to gain access to unpublished information or publications that were not readily available through public sources. These organizations included government Agencies such as the Bureau of Primary Health Care, the Veteran’s Administration and the Indian Health Service; relevant associations such as the National Association for Community Health Centers, the Association of State and Territorial Health Officials (ASTHO), the National Association for City and County Health Officials (NACCHO), the Indiana and Oregon Primary Care Associations (PCAs) and the American Academy of Family Practice (AAFP); charitable foundations such as the Tides Foundation of California and the Robert Wood Johnson Foundation (RWJF); and academic institutions such as the Indiana University’s Regenstrief Center. In many cases, in addition to providing materials for review and synthesis, contacts from these organizations participated in thought leader discussions described in greater detail below. 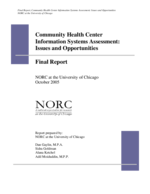 Upon identifying and obtaining these materials NORC reviewed relevant content and important findings were summarized for inclusion in the current report. A comprehensive list of materials identified as part of this scan is included as Appendix 1 to this report. Thought leader discussions. Thought leaders identified for the environmental scan ranged from independent consultants working with HRSA, individual health centers and networks on systems issues to representatives from relevant associations and foundations such as PCA’s and NACHC, to HRSA and Bureau of Primary Health Care (BPHC) regional staff. Discussions were initiated by telephone or email contact with the discussant or his/her staff. Prior to these discussions, thought leaders were forwarded a set of materials describing the overall project and its methods and providing a preliminary set of topics for discussion in the form of a discussion guide. This guide covered basic questions regarding the current state of CHC information systems including commonly observed challenges and issues as well as examples of how CHCs have leveraged existing sources of funding and expertise to enhance their systems capabilities and the specialized needs of CHCs relative to other providers in this area. Although the discussion guide, included as Appendix 2 to this document, provided an appropriate starting point for many of the thought leader discussions, we did not seek a detailed response to each topic across all respondents. Instead, we encouraged each discussant to provide detailed information on issues of which they had particular experience, knowledge, or interest. In some cases, where the discussants’ expertise focused on a particular area of interest rather than broader issues related to the study, we developed a specialized set of questions. Representatives from ASPE and HRSA were provided an opportunity to participate in each of these discussions. Table 1 below provides a comprehensive list of thought leader discussants, their affiliation and the type of information they were able to provide. In addition to the activities described above, NORC has participated in a number of HRSA-sponsored events related to CHC information systems. These include a CAP grantees conference, three sessions with Michael Leahy, Executive Director of the Oregon Community Health Information Network (OCHIN) and HIPPA-compliance related activities with CHCs. Attendance and participation in these meetings have enhanced our understanding of the issues at hand and inform the discussion of project findings provided below. In the sections that follow, we present the results of all of these environmental scan activities and conclude with a section on how these results will be used to inform the subsequent project activities (telephone discussions with 25 CHCs and in-depth site visits with seven CHCs). It is important to note that, due to the mixed methods used to gather this information, some of the results presented (e.g., those that represent syntheses of information from literature) are more generalizable than others (e.g., an impression or perception reported by one, or even several, of our key informants). We clearly differentiate these different types of results throughout the following sections. Still, it should be emphasized that all of the results presented here — other than basic descriptive information on CHCs and HIS vendors and products — are considered preliminary. As described above, the purpose of this environmental scan is to provide basic context and background on the CHC and HIS landscape, and to use this information, plus initial findings from literature and a relatively few discussions with key informants to illuminate areas for further investigation through a systematic set of interviews and site visits.